It was around 11am today when Ry gave me the look. The “mommy I’m hungry” look. So I proactively inquired before the “mommy I’m hungry tantrum” started. Me: You mean like green beans? (Knowing full well he would NEVER ask for those). Ry: No, like the color. Ok. So he wants to eat the color green. Not too bad a request. As much as I just wanted to boil some peas and put them in a green bowl and give him a green fork to eat them with, I decided instead to be a bit more creative. I mean, it’s not like he asked for Chartreuse or Magenta or something. Green had so many options. I decided to go with something spinachy since it is green, healthy, and most importantly, I already had it at home. I finally decided on spinach and parmesan cakes. I had found a version of these on Eating Well but mine are much more flavorful and spicier. The best thing about these is that they are great finger foods for kids and easy to pop in a container for a quick snack or light meal on the go. After I made these, I did end up putting them on a green plate with a green fork and my little man was very happy. 2. 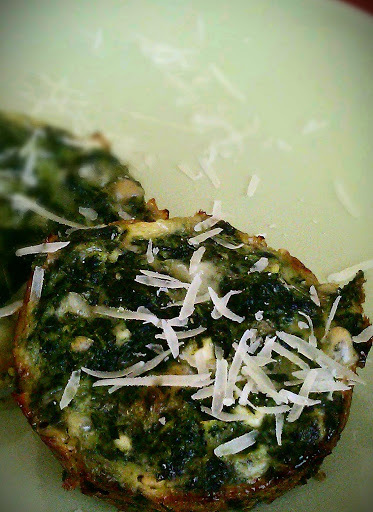 In a medium bowl, mix thawed and drained spinach, cottage cheese, Parmesan, eggs, garlic, onion, and all spices. Stir to combine. 3. Coat the cups of the muffin pan with cooking spray. Divide the spinach mixture among the 8 cups (they will be very full, or 12 cups half way full. (I usually do 12 since I use the smaller portions for feeding the kids). 4. Bake the spinach cakes until set, about 20 minutes. Let stand in the pan for 5 minutes. Loosen the edges with a knife and remove from pan. Serve warm, sprinkled with more Parmesan, if desired. This entry was posted in Muffins/Cupcakes, Vegetarian and tagged Quick Meals, Quick Recipes, Spinach and Parmesan Cakes, Vegetarian by thepantrydiva. Bookmark the permalink. These look very tastee – I'll have to try them!How are you guys doing – drop me a note!